AquaMon™ can help growers meet today’s challenges. Rising populations increasingly compete for water resources while the available supplies remain fixed or, in some cases, are actually dwindling. Costs associated with collection and distribution of agricultural water supplies continue to increase. Monitoring the soil is essential to reduce costs, minimize water consumption and, ultimately, increase crop yields. Attaining optimal levels of moisture in the soil is critical to maintaining crop health and maximizing production. Accomplishing this with less water requires timely soil condition data. Much as electronic monitoring systems permit automobile engines to increase power while reducing fuel consumption and emissions, real-time soil monitoring reduces grower costs and conserves water while preserving (and often increasing) product yields. 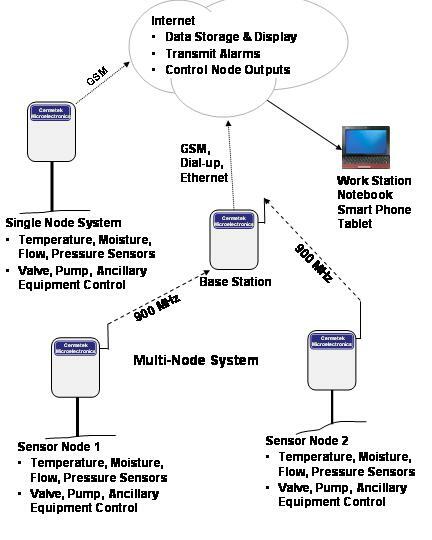 Sensor Nodes and associated sensors. Web based AquaMon™ RSVP software and secure servers. 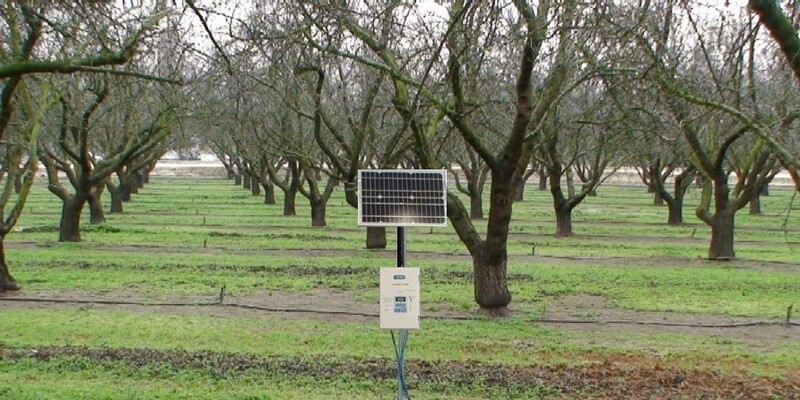 Sensor Nodes: The AquaMon™ System collects soil or system data from field Sensor Nodes and transmits this data to a network Base Station through a robust wireless network. The wireless transmitters within each Sensor Node provide a communications range of up to 10 miles line-of-sight. To overcome obstacles to RF signals such as hilly terrain or to communicate with distant fields, Sensor Node range can be extended by utilizing the repeater capability embedded in all Sensor Nodes. 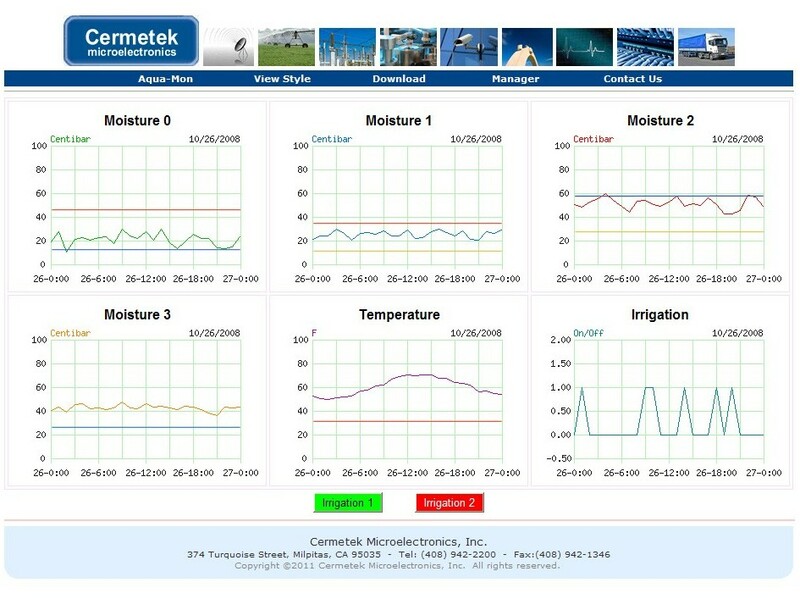 Each wireless Sensor Node includes 5 analog inputs to connect sensors (moisture, temperature, flow, etc.) and 12 digital I/O to control external devices. Each AquaMon™ sensor network supports up to 65,000 network addresses. This permits the grower to install as many nodes as are needed to accommodate variations in soil type, terrain, and micro-climate. Internet Access: The Internet allows sensor data to be viewed from any location at any time. AquaMon™ archives data on secure servers with password (user definable) control. The AquaMon™ RSVP Web based software permits archived data to be viewed on any MAC, iPad, smart phone, or Windows PC hardware platform providing Internet Access. Browsers supported by the AquaMon™ RSVP software include: Internet Explorer™, Safari™, FireFox™, Mozilla™, Opera™, and Google Chrome™. Internet archival provides safe, controlled access to grower specific data. The AquaMon™ RSVP Web based software facilitates analysis of the collected data assisting the grower to assess trends, determine future watering schedules, etc. ; or to consult with a colleague, fellow grower, university or industry expert. Both the grower and the expert can view the same data from separate locations, if necessary. The archived data may be downloaded by the user (supplied by the AquaMon™ servers in CSV format) for analysis utilizing alternate techniques and methods. Remote Control: The RSVP software also allows the grower to turn valves, pumps or other ancillary equipment on and off in the field. The 12 digital I/O on each sensor node can each be connected to the equipment to permit both manual control, from buttons on the software display, and automatic activation when triggered by programmed timers or sensor readings. Email and TXT Alarm Messages: The AquaMon™ system allows the user to set high/low sensor specific alarm limits. If desired, the RSVP software will automatically transmit Email and/or TXT Messages to user specified destination phone number(s) and email address(es). To receive TXT cell phone messages, the user must have this capability activated by their cell phone service provider. GSM/GPRS radio and Sensor Node integrated into a single unit. Sensor Node supports 5 analog sensor inputs and 12 digital I/O. When programmed as outputs the digital I/O can be used to control external devices. GSM/GPRS Radio/Sensor Node unit can be powered by AC line voltage or rechargeable batteries. Battery charging circuitry includes a solar panel. Web based AquaMon™ RSVP software provides Internet access and supports most popular web browsers. The software simplifies data analysis, provides data storage on secure servers, and permits remote valve control. Combination GSM/GPRS and Sensor Node unit. Solar Panel and associated charging circuitry. User supplied Remote Access Device (e.g., MAC, PC, iPad, Smart Phone). Base Station containing both a GSM/GPRS radio and a 900MHz ISM RF Band Hub. 900MHz ISM RF Band Sensor Nodes. RF Nodes transmit at up to 500 mW supporting a range to 10 miles line-of-sight. Repeater Nodes extend sensor network range. Base Station collects data from Sensor Nodes and uploads the data to the Internet. Sensor Nodes can be powered by AC line voltage or rechargeable batteries. Base Station containing GSM/GPRS radio and 900MHz ISM Band RF Hub. 900MHz ISM Band RF Sensor Node(s). Solar Panels and associated charging circuitry for each Sensor Node and, optionally, the Base Station unit. Base Station containing an Analog Modem and a 900MHz ISM Band RF Hub. Node supports 5 analog sensor inputs and 12 digital I/O. When programmed as outputs the digital I/O can be used to control external devices. Repeater capability extends the range of the sensor network. Base Station collects data from Sensor Node(s) and uploads the data to the Internet. Solar Panel and associated charging circuitry for each Sensor Node and, optionally, the Base Station unit. Base Station containing an Ethernet Port and a 900MHz ISM Band RF Hub. RF Modes transmit at up to 500 mW supporting a range to 10 miles line-of-sight. Repeater modes extend sensor network range. Base Station contains an Ethernet port and a 900MHz ISM Band RF Hub. 900 MHz ISM Band RF Sensor Node(s).